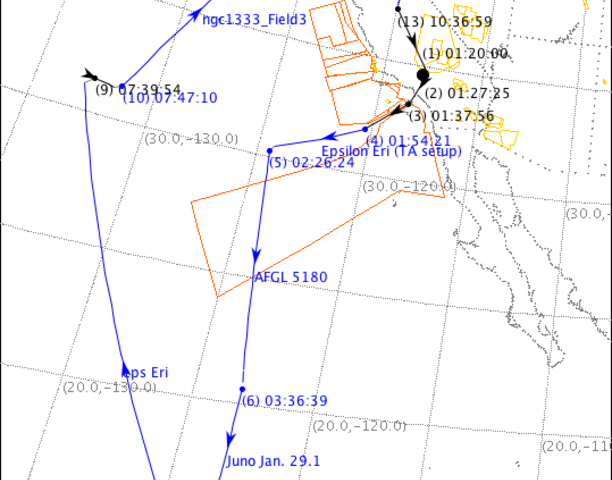 As with most other telescopes, astronomers apply for observing time on SOFIA by submitting proposals that are being evaluated by peers for their scientific promise and intellectual merits. 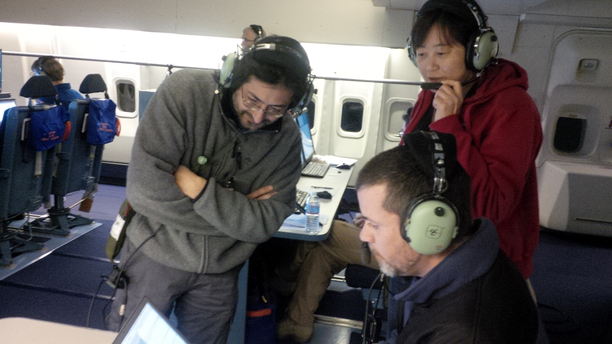 SOFIA, however, is special in that observers also can apply to be onboard during an observation run. Kate Su of the University of Arizona talked about what it was like to be aboard NASA's flying observatory while the telescope was trained on the object of her scientific interest. Q: What is your motivation to study planetary systems like Epsilon Eridani? A: Epsilon Eridani is the closest star that hosts a debris disk. Therefore, many consider it to be the Rosetta Stone for sunlike planetary systems. At 800 million years, it's much younger than our sun (800 million versus 4.5 billion years), so we think it has properties similar to the early sun. Its proximity makes it a prime target to perform high angular resolution research to understand the early evolution of our solar system. Q: What are the advantages of SOFIA compared to ground-based and space telescopes? A: Being able to be above most of the Earth's atmosphere, SOFIA can operate at wavelengths that can't be observed from the ground, especially the mid-infrared wavelength that the warm debris dust emits most efficiently. I am interested in the inner debris zone around Epsilon Eridani where warm dust emission was originally discovered by Spitzer (an infrared space observatory). Therefore, SOFIA is an obvious choice to do follow-up work for Epsilon Eridani. Q: What was it like to fly on the SOFIA plane? A: Guest observers like me have to complete a safety training about the emergency procedure onboard the aircraft on the day before the flight. The airplane looks like a normal commercial plane from outside, but it's totally different inside. There are a few first-class seats available in the front of the cabin for education outreach. The rest of the cabin is like a big cargo hall where many computers and equipment are located, just like a normal control room of an observatory, except that everybody needs to wear headphones with a mic to communicate during the flight. It was very cold inside the cabin, not like a commercial airplane at all. Q: What scientific questions came out of this project? What is next in your research? A: The original Spitzer discovery suggests the Epsilon Eridani system is complex, with multiple dust zones similar to our solar system. However, the spatial resolution of Spitzer was pretty poor, so there are other alternatives to explain the data with a simpler dust distribution. SOFIA has a larger telescope, i.e., a better spatial resolution. With the SOFIA data, we are able to show the Epsilon Eridani system is indeed more like our solar system that has a population of leftover planetesimals in the inner region. These leftover planetesimals can be distributed in one broad region or two narrow belt-like regions, with the inner one similar to our own asteroid belt and outer one at about 10 to 15 astronomical units, which in our solar system falls into the region between Saturn and Uranus. SOFIA's resolution is not high enough to differentiate the two distributions. However, the soon-to-be launched James Webb Space Telescope has a very sharp infrared vision that will pin down the location of dust debris and resolve the detailed structure of the inner debris zone. 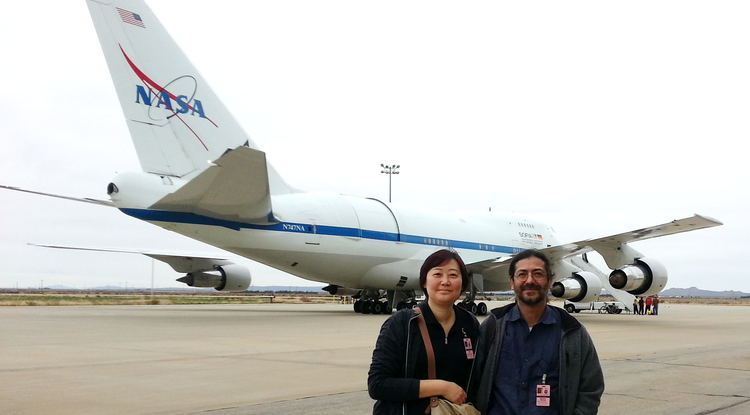 Kate Su: "One of the instrument scientists was processing the data we took during the flight. We were all very excited to see the data."